Create the perfect centerpiece in your kitchen with the Elena Two-Tone Antique Finish Kitchen Island Buffet by iNSPIRE Q ® Classic. The kitchen island features an oak finish top and several antique finishes for the base for a contrasting look. It comes with two felt-lined drawers and two open shelves to display your kitchen items. 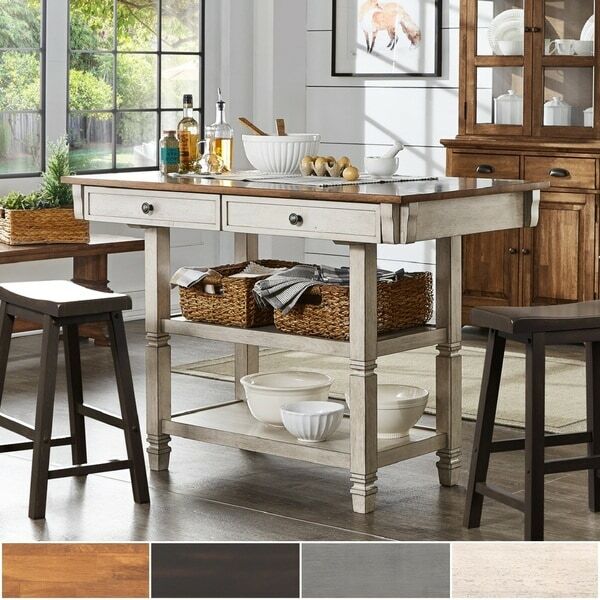 Constructed of solid rubberwood, this island will go perfectly with styles from vintage, modern farmhouse, or shabby chic. At iNSPIRE Q ®, our designer-curated lifestyles reflect current trends and timeless essentials, giving you the know-how to achieve your vision. With diverse style inspirations to choose from, you'll be able to find the one that speaks to you - or mix and match across collections for a style that's all your own. Whether you're cool and contemporary, retro, free-spirited, vintage, or classic, iNSPIRE Q ® is here to help you achieve the home of your dreams, every step of the way. Click here to explore the six style inspirations: iQ Bold, iQ Modern, iQ Classic, iQ Artisan, iQ Junior, and iQ Oasis. We loved this piece. We live in a small apartment in San Francisco which is very old. There is no counter space and we love to cook. It is a great addition to our kitchen. We now have way more space to cook than ever. The best part was that it was VERY easy to assemble. The box that arrived was really large and super heavy. That being said, it's a quality piece and the easy assembly made the heavy lift worth it. I love this island. I have a large kitchen but it is not as wide as I would like. This island increases functional space and enhances the kitchen appeal as well as gives us extra seating when needed. The island does not clutter up the space or impede the traffic pattern. It is great quality and very attractive. love this antique kitchen buffet - fits nicely in my dining area and offers many uses. enough room for two people to sit and chat over coffee or prepare a pie! i will be ordering the saddle stools next to complete the set! very well made, easy to assemble, antique white color great. This island is even better in person. Extremely happy with the quality and the overall look. It was easy to assemble with one person. Do not hesitate to purchase this if you are considering a kitchen island. It was very easy to put together and looks great in my kitchen. I love that it has levelers on the bottom, which helps keep it stable on my tile floors. However, one of the drawers does not pull out completely without pulling all the screws out on one side. It is a quality island and fits our kitchen space perfectly. I have had this counter height table in my new kitchen remodel for months and absolutely love it! Good quality, very nice felt line drawers with smooth operation. Love the function and look of this table! 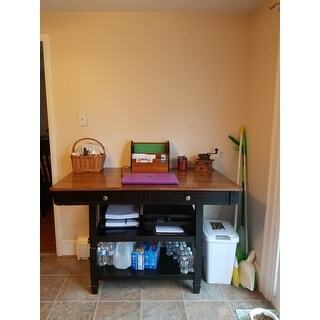 This piece is perfect for our kitchen office/extra counter top space! I love that the drawers are lined! Love this island. It did not disappoint :) This will be a piece that will stay in the family for a long time. It looks like it has always been part of the kitchen :)) Love it!!!! I can’t say enough about my new island. We live it and is just right for our remolded kitchen. It came faster than I expected and it was easy to put together which made my husband very happy. Very solid and sturdy piece. I would buy this over and over. Can't beat it for the price. It looks perfect and as advertised. I was pleasantly surprised by the quality and ease of assembly. The picture does a great job of revealing the true piece. We have had many compliments and are totally happy with the purchase. The Salvadore Saddle Back stools make a wonderful combination. I bought the black, wow, couldn't match my kitchen better like it was built in!! Fast shipping, super easy assembly, strong and well built also bought the stools to match!! We absolutely love this island! The top is like a butcher block piece-very easy to clean and very durable to everyday use. Very sturdy also. "do you have to put the drawers together?" Hello, please note the drawers already come together. "Is the top made of solid wood or is it a veneer?" Hello it is made of Rubberwood. "How much does it weigh?" "Can the bottom shelf be left off so that there is just one shelf?" "Really interested in this buffet, any chance it will be available in antique white?" 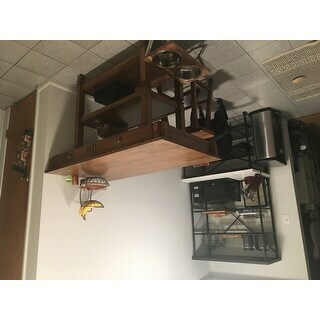 Hello, this buffet has fixed shelving which can not be moved or adjusted. The openness. Does not look like a boxey piece of furniture.